This is a common consideration that needs to be made for those choosing an air conditioning system. Each type of system has both pros and cons that need to be evaluated in order to make the right decision to suit your needs. Let’s take a closer look at both of these air conditioners so that you can make an informed choice. These systems are installed as an external and internal unit. The treated air is generated via compressors and distributed throughout the home using a network of ducts. These ducts are typically installed in wall, ceiling or floor spaces, and only the air vents are visible. A ducted system is a good choice for homes that have hard to reach spaces, such as multi storey properties and larger homes that have lots of rooms. A high capacity ducted system can be fitted as an alternative to installing a number of separate split system units. Ducted air conditioning systems should ideally be installed during the construction of the home. There are many benefits to choosing this system, such as silent operation, effective zoning, and advanced climate control. Zoning is particularly attractive for many homeowners. The home can be configured to have different climate settings in different parts of the home. Ducted systems are quieter than split system air conditioning system and are pretty much inaudible. Advance climate control can be used via WiFi using an appropriate app and allows an incredible level of control. This is a more conventional method of air conditioning using a single compressor that works with a blower unit. A wall unit has to be installed in every room or space that needs to be cooled and heated. These systems are far easier to install, and no ductwork is required. These systems are usually much cheaper than ducted systems, and they are an ideal choice for smaller homes. They are not a good choice for larger homes as multiple compressors would be required, and that would not make economic sense. Although wall units are obvious, recent offerings can be had in different colours other than standard white to match your decor. Control is carried out using a remote control that can include useful features that may be fitted. Airflow direction control can change the angles of vanes in the vertical and horizontal to direct the airflow more accurately. The most advanced systems can have air ionisers and HEPA filters to improve air quality by removing bacteria from the air. Another new technology is iSensor, which has sensors implanted into the wall unit to detect the presence of people and deliver the air direction towards them. If they are considering a split system air conditioner, Perth homeowners should contact us here at Gas & Air. 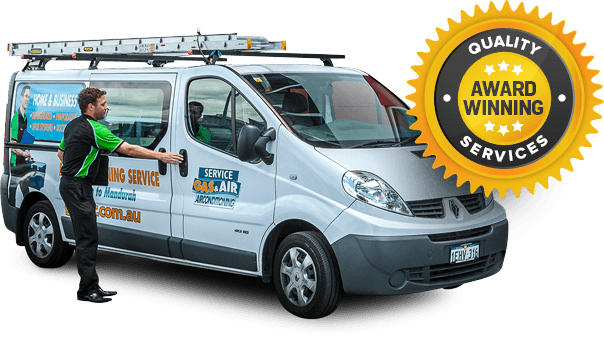 We can supply, install and service a wide selection of heating and cooling equipment, including air conditioning split system models. Our technician team is well trained to deal with all kinds of servicing and repair issues that might arise. Our sales team is anticipating discussing your needs in greater detail and to answer any other questions you may have.